last week I spent the day in Graham Coleman’s lab, down in Dorset. Back to school for more damp diagnosis training. Graham kindly invited me down there for an intensive day of tuition on a one to one basis. I’ve attended many presentations and training courses with Graham, usually at the Property Care Association’s HQ and I jumped at the chance to visit him. 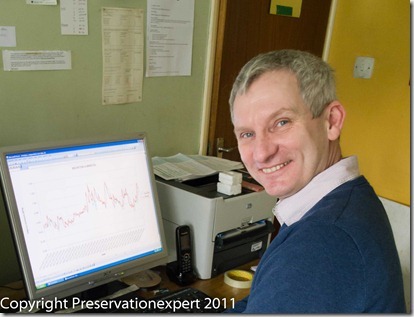 About half the time was spent on the computer playing around with data from some of my damp surveys done around Yorkshire using Lascar humidity and temperature data loggers. 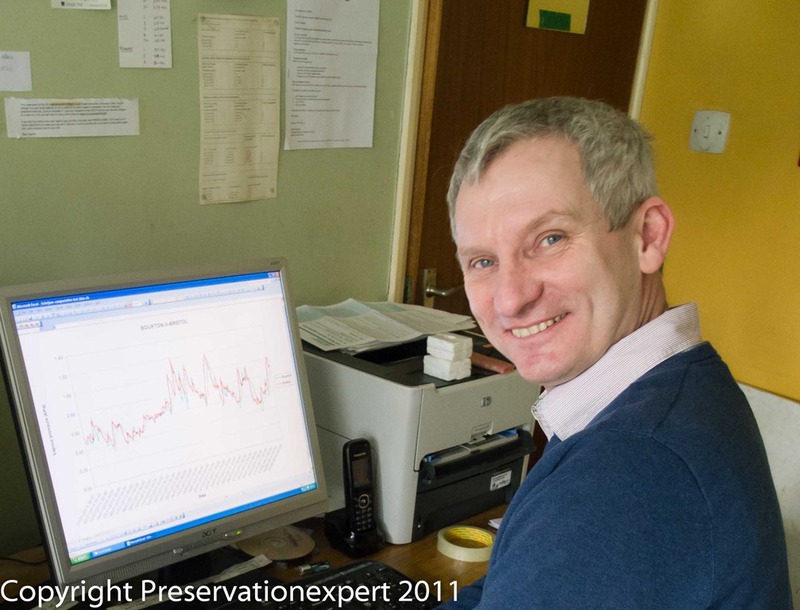 Graham has refined his bespoke spread sheets to enable extrapolation of RH’s at various air temperatures so it is easy to simulate the effects of raising or lowering the heating in a house effected by mould or condensation. We produced lots of graphs and discussed the best ways of getting the message across to clients, without confusing them with the science. 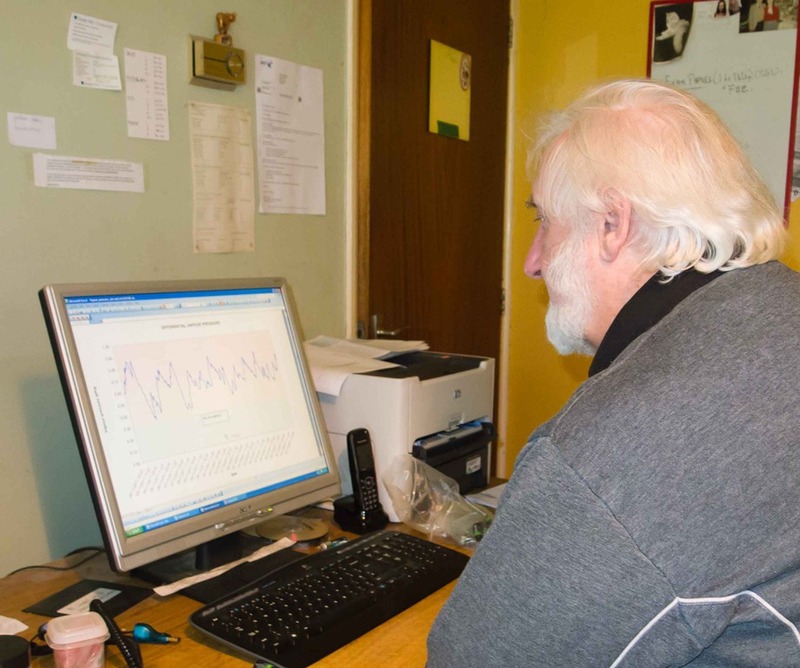 Graham has been using ibuttons to compliment the Lascar data loggers, allowing simultaneous surface temperature readings to be obtained, to add to the diagnostic process. These are great little toys and I’ve now bought a starter kit with the software and Graham actually gave me a couple of ibuttons to get me started off. We then moved onto gravimetric testing and Graham showed me his lab equipment and took me through his vast collection of lab books, going back decades. Leafing through the books was an eye opener, with all the neat columns of total and hygroscopic moisture contents from thousands of samples he’s analysed over the years. He looked me in the eye and said “if you compare the results from these profiles they almost always agree with the profiles obtained using a conductivity moisture meter”. That’s comforting for me, bearing in mind that i specify almost all my work using my Protimeter MMR. However, for precise accuracy you cannot beat the gravimetric method, which allows calculation of the capillary or free water content, as opposed to the hygroscopic or air dry content. The basic method is described in BRE 245 but of course Graham has such great experience and carefully took me through the methods and equipment he’s found works best – priceless knowledge for me to use for the benefit of my clients and I’m very grateful to Graham for taking me under his wing. 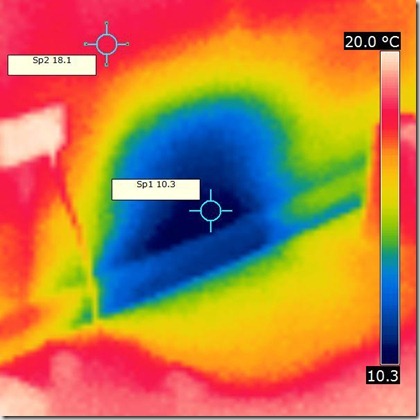 Furniture moved - the cold blue area shows why mould finds these places so healthy. 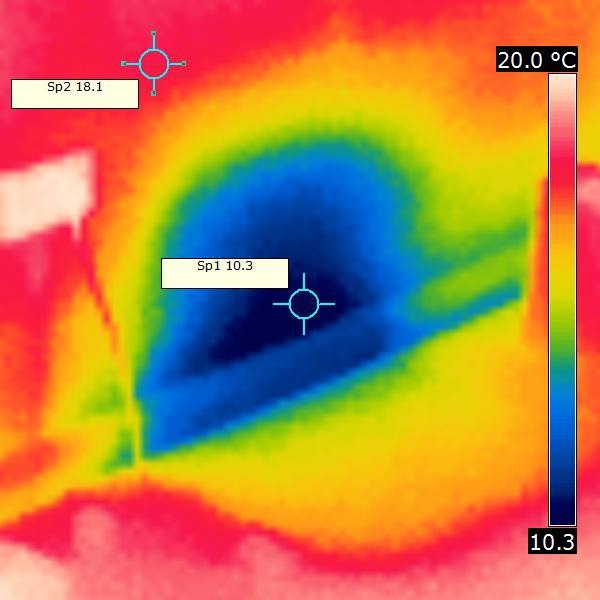 We also messed about with Graham’s infrared camera and this is the cold spot we found when we pulled his pouf away from the lounge wall – quite a temperature difference eh? Salt testing was covered and Graham is coming up to my Sherburn in Elmet office later in the year, for another master class – I can’t wait!